Firstly, I had a bit of a disaster. I had to decant some more metallic blue yesterday. I thought that I had left it long enough for the propellant to disperse but... I opened the bottle this morning and it blew everywhere, including over the bonnet of the Cobra! So, I have had to re-do the whole front of the car. Unfortunately, one of the things that got covered is the white circle with the racing number on it. Remember that I was very pleased to have obtained these from the Ferrari GTO kit. This means that I am left without a number on the bonnet. 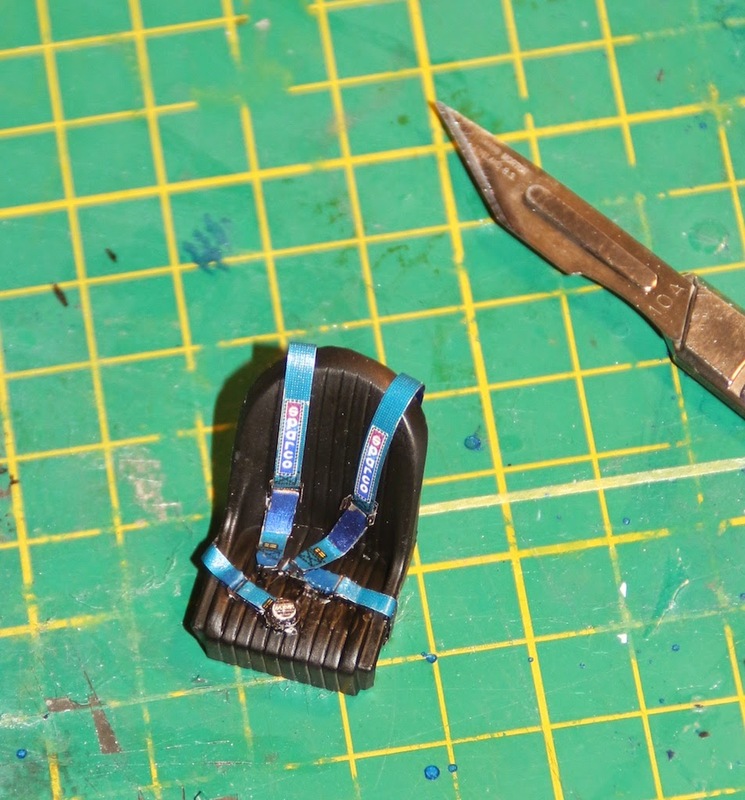 As it happens, the Fujimi kit had three white circles on the decal sheet so I can, at least, replace that easily. The number 3 is a bit of an issue, though. As part of my Model Railroading, I have been re-decalling my locos from the supplied road names into my own Sunset & North Eastern Railroad (for more details, check out my Model Railroad blog HERE). This means that I have a stock of white decal sheet which can be printed with an ink jet printer. All (??) I have to do is to scan the side of the body, which will give me the bulk of the 3. From there, in Photoshop, I can create a new 3 and print it out in black on the white background. I should, then, be able to use that to finish everything off. I didn't take any photos as I was pretty ashamed but it is going OK so far. Mind you, I have still to repaint the thin blue line between the two white stripes so - Watch This Space! As it is a dismally cold day with intermittent snow, I have spent most of the time at my desk making the blue seat belts - yes they finally came in the post today. These, if you have read my GT40 entries, are very fiddly to make but look great when finished. here is the sheet of etched nickel as it comes. You can see that I have made up the two shoulder straps. Here is the completed seat. 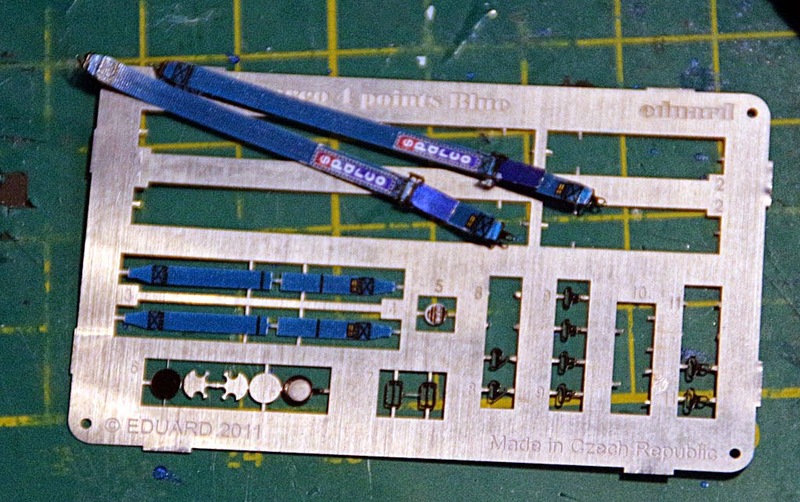 I have left the scalpel in the image to set some idea of scale!